Published: March 4, 2019 at 08:14 p.m. Updated: March 4, 2019 at 08:31 p.m. The 2019 NFL Scouting Combine was defined by an elite pass-catching crop, Kyler Murray's absence, and a disappointing day for running backs. While this year's receiver crop is the fastest group since official combine data started being recorded in 2003, the incoming rookie RBs appear far weaker than the last three elite classes. In this space, we'll comb through the new combine metrics and see who helped (or hurt) their future fantasy stock. Question marks remain about Metcalf's overall production in just 21 games across three years at Ole Miss and whether or not he is agile or polished enough to run a full route tree, but this much is true: He is a freak specimen. 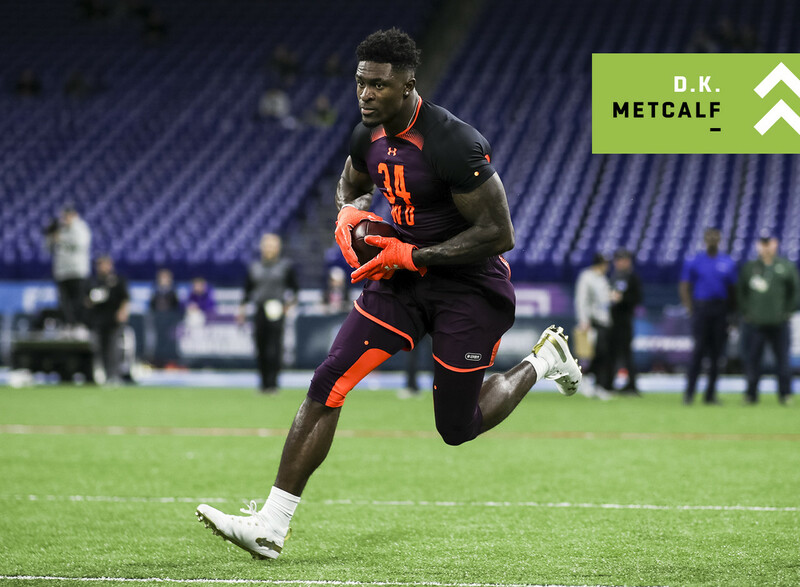 Standing 6'3" and weighing 228 lbs, Metcalf joined Calvin Johnson as the only players in combine history to run a sub-4.35 forty-yard dash while weighing over 225 lbs. For reference, Megatron ran a 4.35 forty at 239 lbs. While Metcalf never had more than 39 balls in a single-season, he was just as productive as fellow Ole Miss standout A.J. Brown on a per route basis last year. Per PFF's FBS data, A.J. Brown (2.93) and Metcalf (2.91) essentially gained the same amount of yards per route run in the 2018 season. Metcalf only played in seven games (neck) last season while Brown played all 12. I still have N'Keal Harry and Hakeem Butler ranked over Metcalf in my dynasty rookie ranks, but Metcalf has certainly solidified himself as a top-tier prospect. Metcalf's superb day stole all the headlines, but Noah Fant's combine was arguably just as impressive. Similarly to former Iowa Hawkeye George Kittle, Fant is a size-speed freak with nearly the same exact measurables. While Kittle ran 4.52 at 247 lbs, Fant ran 4.50 at 249 lbs -- giving both TEs a 96th percentile weight adjusted speed score. In fact, Fant's day was so impressive that he posted the seventh-best forty-yard dash time and seventh-fastest three cone time (6.81) for any TE since 2003. Not only is Fant one of the quickest and most agile tight ends to enter the draft in history, he's also an elite red-zone scorer. The towering 6'4" receiver turned his 14 targets inside of the 10-yard line into 11 TDs over the last two years at Iowa (per PFF). Fant is a future fantasy stud. Besides being a little bit old for a rookie -- Butler turns 23-years-old in May -- the former-Cyclone checks nearly every box you want for a future No. 1 receiver. Evidenced by his 98th percentile height adjusted speed (4.48 forty at 6'5") and absurd 22.0 YPR in his final season at Iowa State, Butler is easily one of the most explosive threats after the catch in this year's class. An absurd 55 percent of Butler's catches gained 20 or more yards in 2018 (most in class) while he accounted for 42 percent of Iowa State's total passing yardage output in his final-season (second-highest share in class). Depending on where and when he is selected in the NFL Draft, Butler may end up being the No. 1 overall pick in rookie dynasty drafts this summer. Year in and year out, the Buckeyes continue to produce incredible athletes. Not only did Campbell tie the fastest forty time in the receiver group (4.31), he posted the seventh-best broad jump (11'3") in combine history. Campbell also joined Curtis Samuel -- who ran a 4.31 forty-yard dash in 2017 -- as the fastest man to hail from Ohio State. Campbell wasn't a huge multi-year producer at Ohio State, but he easily led the team in receptions (90), yards (1,063), and TDs (12) as Dwayne Haskins' preferred target in 2018. While Noah Fant was busy having one of the 10-best combine's ever by a tight end, his former-teammate wasn't too shabby himself. Hockenson's athleticism doesn't show out in one particular area, but he earned a rock-solid 88th percentile SPARQ rating that combines all of the athletic testing metrics into one cumulative score. For reference, Noah Fant is a 98th percentile SPARQ athlete while George Kittle's 2017 testing earned him a 97th percentile score. Fant doubled Hockenson's TD output across the last two seasons at Iowa, but the elite duo's reception and yardage totals were nearly identical (Fant: 69/1,013/18; Hockenson: 73/1,080/9). Boykin's overall production at Notre Dame wasn't stellar (77/1,206/11 in 26 games), but the 6'4", 220 lbs "mon-star" joined the list of Space Jam-like receivers in this year's crop. All of Boykin's core combine metrics -- height adjusted speed, burst, and agility -- all rank in the 89th percentile or better on PlayerProfiler.com. Boykin isn't considered a top-10 rookie receiver yet, but he could scream up fantasy draft boards this summer if his combine performance earns him earlier consideration in the NFL Draft. One of just two backs to post a 90th percentile SPARQ score or better in this year's crop (the other is Justice Hill), Barnes is really the only rusher to slightly help his stock at the combine as Damien Harris, Darrell Henderson, and David Montgomery's performance fell flat. Note, Josh Jacobs did not participate in any drills. Coming off a stellar season at K-State (276 touches, 1,549 scrimmage yards and 12 TDs in 12 games), Barnes is a potential sleeper to keep tabs on as his final-year production and near-elite burst and agility metrics has earned him a second look amongst the fantasy community. The not-quite consensus top receiver in the class did all he needed to at this year's combine, posting an 89th percentile height adjusted speed score to pair with 27 reps on bench press and a 38 and 1/2-inch vertical. Harry's build, athleticism, and early breakout age compares almost identically to Allen Robinson. At 19- and 20-years-old, Harry posted back-to-back seasons with 70 or more receptions and 1,000 yards over the last two seasons at Arizona State. Harry's name will be called early at the NFL Draft. While Dwayne Haskins competed and threw at the NFL Combine, Murray participated only in interviews and the media portion of the event. Feverish hype and height-based narratives will continue to surround the Heisman winner, but there is no denying Murray's lethal accuracy and play-making ability. Murray's 72.6 percent adjusted completion percentage is far more impressive than Haskins' 72 percent clip once you adjust for depth of target (Murray: 11.9 air yards/attempt; Haskins: 9.1). Incredibly, the former-Sooner also earned a higher broken tackle rate (21.4 percent) than 2019 RB prospects Trayveon Williams, Benny Snell, Damien Harris, and Dexter Williams (credit: Hayden Winks and Sports Info Solutions data). We'll see Murray likely run the forty-yard dash and throw in shorts at Oklahoma's Pro Day on March 13. Harmon was one of a few receivers at this year's combine to actually hurt their stock. His 4.60 forty time at 6'2" isn't too bad, but his agility (20th percentile) and burst (14th percentile) scores leave a lot to be desired. Overall, Harmon's SPARQ score ranks just 26th-of-37 in the class (per Zach Whitman). Still, Harmon owns back-to-back 1,000-yard seasons to close out his career and posted 100 yards and/or a TD in 9-of-12 games last year. Perhaps the combine's biggest disappointment, Elijah Holyfield tested as a lowly 5th percentile athlete (worst in class) as his 4.78 forty-yard dash at 216 lbs compares closest to David Cobb (229 lbs) and Kenny Hilliard (226 lbs). Yikes. Not only is Holyfield a marginal NFL athlete, but he caught just 7 balls across 27 games at Georgia. Rarely does a combine performance create this many questions.